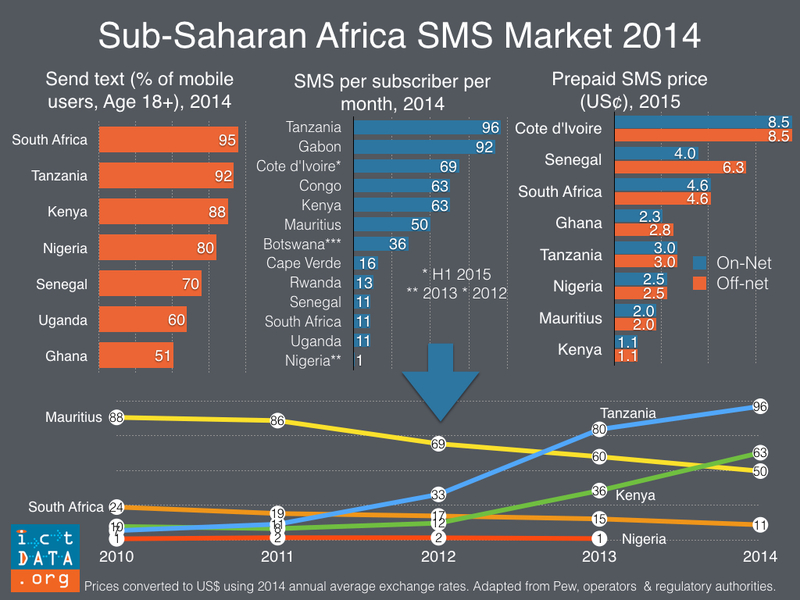 While SMS is declining in most developed markets due to competition from Internet-based messaging applications, the picture is more nuanced in Sub-Saharan Africa. In some countries, growth has been explosive, in others it has been flat and in a few, usage is declining. Tanzania is the region's SMS superstar with the highest volume of SMS (34 billion sent) and the highest number of text messages sent per subscriber per month (96) in 2014. 92% of Tanzanian cellphone owners use SMS, the 2nd highest proportion in the region among countries for which such statistics are available. Growth has also been solid in Kenya. It is interesting that texting growth continues given that newer subscribers tend to be more marginal and not intensive SMS users. SMS has been in decline in two of the region's more sophisticated mobile markets, Mauritius and South Africa, no doubt due to rising smartphone penetration and alternative messaging applications. 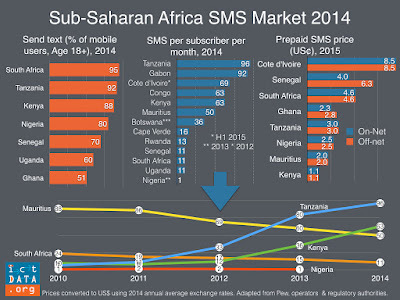 In some countries, the SMS market is stagnant. Nigeria is a good example where despite regulatory interventions by the Nigerian Communications Commission (NCC) to lower SMS prices, the market is flat with barely over 1 billion texts sent in 2013. NCC reduced the SMS termination rate to N1.02 (0.64US¢) in 2009 and established an off-net price cap of N4 (2.5 US¢) in 2013. It seems to have had little impact where on average a mobile subscriber sends just 1 text per month even though Nigeria has relatively low retail prices and 80% of mobile users claim to text. Substitutes for texting are likely prevalent in Nigeria; according to Facebook there were 12 million Nigerians using their mobile phone to access the social network in December 2015, the largest market in the region. In general, prices would seem to stimulate usage. In Kenya it costs just 1.1 US¢ to send a text for those not on a plan. In Tanzania, an SMS data plan gives 10 texts a day for 9.1 US¢. Familiarity with other popular text-type applications may make users comfortable with SMS. This appears to be the case in Kenya and Tanzania where there is high mobile money use. Some 130 billion SMS were sent by Sub-Saharan African mobile subscribers in 2014, generating estimated revenues of US$ 1.7 billion for the region's mobile operators.